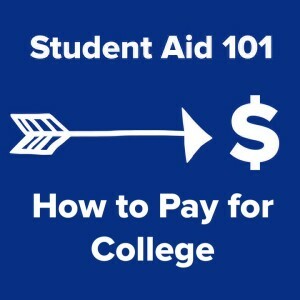 What Can I Do to Pay for College? If you want to continue your education past high school, you might have some concerns about how to pay for college. Although education can be expensive, many resources exist to help you meet your educational goals. It takes some planning, ingenuity and dedication, but you can afford to get the education you want. The three types of funding you can use to pay for higher education scholarships, grants, and loans. Once you learn about these, your next step will be to begin applying for the financial aid that you need. Then it’s off to college! Scholarships are funds for education that are received on some sort of merit. You can earn scholarships based on your grades in high school or other schooling. Some scholarships take into account scores from tests such as the SAT or ACT. Other scholarships require applicants to compete against one another by writing essays or submitting research ideas. Some scholarships are performance based in other areas. Sports scholarships are popular ways for traditional students to earn funding for college. Music scholarships are also popular. The best thing about scholarships is that you receive the funds for schooling on your own merits and don’t have to pay the money back later. Some scholarships are one-time opportunities while others can be renewed year after year. Some renewing scholarships have strings attached. You may be required to maintain a specific grade point average or take specified classes to keep these. When searching for scholarships, consider your own strengths, and apply for scholarships that play to them. Grants are similar to scholarships in that you don’t have to pay back grant money once you have completed your schooling. Unlike scholarships, however, grants are given based on factors other than personal merit. You don’t have to be smart, talented or athletic to receive grants. Many grants are income-based. These are particularly helpful for those wishing to attend college but come from low-income families. Other grants are based on ethnicity, race, gender and personal background. Military veterans are often eligible for many different grants, and children of veterans may also be eligible for specific grants thanks to the service of their parents. Grants are monies you can get based on who you are rather than what you can do. No one wants to go into debt in order to get a degree, but sometimes loans can be beneficial. After you’ve applied for several different grants and scholarships, take a look at the student loan options available to you. Student loans are guaranteed by the United States government, so anyone can qualify to get one. These loans can help pay for tuition, room and board, or living expenses during your time at college. Higher education isn’t cheap, but it is rewarding. If you’re planning to enroll in an affordable college soon, it’s time to get organized so that you can pay for college. The resources are out there. All you need is confidence and motivation to take advantage of them.